High-profile US psychic Mark Edward recently appeared on BBC1 talking about his new book 'Psychic Blues'. Since the 80's he has corresponded and collaborated with Cornish artist-magician Tony 'Doc' Shiels. 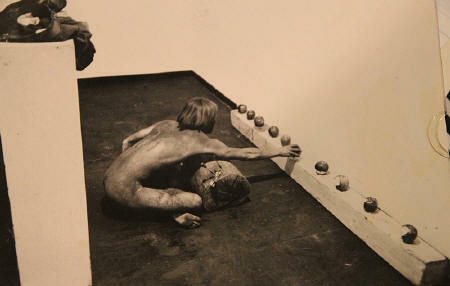 You were at CalArts in the early 70's studying conceptual art with John Baldessari (picture below right). Who were the most interesting artists around you at that time? Joseph Beuys, Chris Burden, Vito Acconci, The Kipper Kids and Carl Andre. In what way did Baldessari encourage your interest in stage magic and mentalism? Did he want you to incorporate it into your art or develop it as something in itself? He encouraged me to focus on the concept, think minimally, cut to the chase, avoid decorative embellish-ments and get more into the street i.e. the public arena away from The Art World. He first introduced me to the art of Tony Delap, a sculptor whose works contain magical references and a person who has over the years become one of my best friends in both the magic and art worlds. He understood that the process of making art (or being art) superseded the representational aspects that simply hang on a wall once they are finished. You formed a street magic group with some performance majors from CalArts? How did that work? What did you do together? A group of starving Theater School students who performed circus arts such as juggling, fire-eating and acrobatics formed The Rainbow Theatre with a couple of other magician friends of mine. We approached the Southern California amusement park Magic Mountain with the question, “This is called Magic Mountain, so where’s the magic?” They bought the idea and we began roaming outside in the streets of Magic Mountain doing live sets around the park. We entertained long lines waiting for rides, special events and other media programs. You then worked at Hollywood’s Magic Castle – which seems like a pretty unique place. Is it? How would you describe it? The Magic Castle is a private club and the showplace for some of the greatest magicians from around the globe. The owners take great pride in showcasing the magnificent building that houses the Magic Castle. Built in 1908, this storied mansion has watched Hollywood grow and change for over 100 years while never losing its original charm. There is no other place like it in the world. It has been my “Home Away from Home” since I started working there in 1975. For over 14 years, I had the privilege of acting as one of only a handful of trained “mediums” in their specially appointed “Houdini Séance Room (picture below left).” It was during my tenure there that I first became aware of the work of Doc Shiels. I avidly read his writings and for many of those years we corresponded by snail-mail, discussing the theory and practice of psychic entertainment and how to create a believable persona, séance situations, media hoaxes and public displays of bizarre magic. I doubt there was (or ever will be) a more knowledgeable source of information on these subjects anywhere on the planet. We still write and exchange art with each other. No. it wasn’t difficult at all. I enjoyed talking to people and hearing their incredible tales and woes. It was very cathartic and entertaining for both parties. In doing this kind of “service” job, I became aware of the huge manipulative world of the “professional psychic” and became acquainted with many people I would never have imagined I would come into contact with. Having my magic background was a huge help in understanding and forging an entertaining way into people’s lives and I developed a great respect for the very few “intuitives” I met along the way who were not exploitive or corrupt. My book “Psychic Blues” couldn’t have been written without the careful and stealthy infiltration of this market. Coming back to Doc Shiels who was then living in Cornwall, UK. In what way was he a mentor? 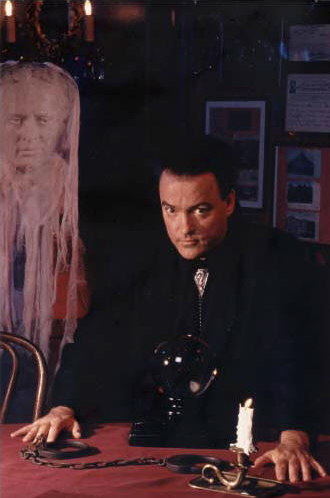 When I was first asked to become a trained medium at The Magic Castle, I really didn’t have a clue how to put together a viable persona or how to go about making the sort of believable character that is so important in selling the idea of mediumship to the sitters in a séance circle. All I really had to go on was the unfortunate Hollywood stereo-types I had seen in movies and television. I didn’t want to appear as a cardboard cut-out character and I made it my goal to take on the personality of a real wizard, albeit a low-key, self-effacing one. Doc opened up a whole new horizon for me when I first read his 1976 book “The Shiels Effect,” which is all about who the next “Psychic Super Star” will be and how this person will emerge. This was post-Uri Geller and had a lot to do with getting the attention of the media, doing your homework and playing the part “for real.” I still consider Doc my mentor. He is not only one of the pioneers of bizarre and storytelling magic, but an artist in many areas most standard magicians have never dreamed of. We share many of the same literary heroes, film and radio actor passions and appreciation for alchemy, surrealism and the unconscious. An article was written for Fate magazine that I know you and he worked on. Penned by Luna Mars, it involved Unidentified Submerged Objects (aliens), whales and humans. It sounds bizarre (and of course it was meant to) but can you describe it better than I have? Basically, Doc, Luna and I set out to convince the world that there was soon to be a gigantic interspecies communication-breakthrough involving whales and other cetaceans, who, by the expedient of the then burgeoning scientific investigations into whale language patterns, would act as intermediaries for aliens living deep in the ocean and set the stage for them to finally come out of hiding. At that time, there was a great concern about the American Navy’s sonar systems that were scouring the deepest waters, supposedly searching for Russian submarines. We suggested that these arrays were searching in waters that were for too deep for any submarine to navigate, so just what were they searching for? Also, at this time thousands of whale beachings were occurring around the world. The sonar systems were being blamed for upsetting the delicate eco-balance of the whales. Part of the tension we were after was building this “end times” scenario for the whale species. Their last ditch attempt at saving us humans, etc. This was at roughly the time when “The Abyss” was making the rounds in movie theaters and we took full advantage of the aquatic aspects of that film. We pulled together as much credible “scientific” information as we could, and sent it to FATE. It was taken in hook, line and sinker. 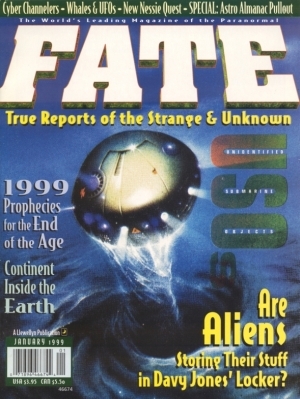 You also worked on some related conspiracy theories, which were mainly published in Fortean Times over several months with Doc Shiels. Can you give us a flavour of them, and how they developed? I think you might be referring to “The Case.” Since this is still an ongoing members only secret project, suffice it to say there are many artists, writers and surrealchemists involved across the world. Without getting into too many details here, it involved an international attempt to create “The Mother of All Conspiracy Theories” and took all of us on quite a few unexpected paths that I can only state were at times extremely intriguing and at other times bordered on unintentional espionage.